I have spoken many times of pearls unseen right under my nose, but this is one of the biggest finds yet. I pass 101 Spring Street every day, frequently twice - a building scaffolded and in serious need of renovation. On August 14th, 2007, I wrote of a homeless girl, Stephanie, who was camped out in front of this building for some time. In fact, the posting struck a chord - it was one my most commented. See it here. Ironically, we are back again. I have observed this mysterious stack of bricks for years, the only occupants of the ground floor of 101 Spring - in one of the most expensive neighborhoods of New York City. See second photo here. 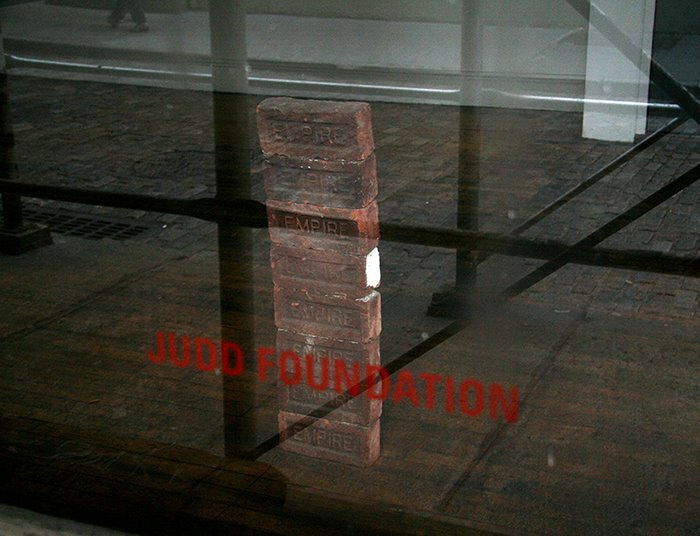 But if one looks carefully at the side window, in small red lettering you will see Judd Foundation. Ahhh - now the mystery is easily solved. The building is Donald Judd's previous home. Judd, a renowned sculptor and influential artist, was an early pioneer in SoHo. He purchased the building in 1968 for $70,000, where he lived and worked on and off until his death from lymphoma in 1994. The building serves as a house museum with works of Judd and other minimalists. The whole story is fascinating - I recommend this New York Times article. How do they do it, i.e. how is this place supported? In 2006, the Donald Judd Foundation decided to auction 36 Judd sculptures at Christie's and raise a $20 million dollar endowment. Oh, and the stack of eight Empire bricks? This is the work of Carl Andre - the piece is known as Manifest Destiny. Explanation of the photo. This exposure was taken from the street through the window - with a mixture of interior objects and reflected objects from the street. Note the outside sidewalk superimposed on the interior white wall. The dark braces are reflections of the supports for scaffolding being used in the exterior renovation work. The interior wood floor abuts the reflected image of cobblestone from Mercer street. See second photo here.